The Bliptronic3000 was an interactive installation in the Big Blip 2005. The project was undertaken while I was studying for an MA in digital media art at Brighton University and was a collaborative project with Sean Toru. Bliptronic3000 is an enquiry into how the real and the virtual can be used together in a coherent artwork. A large majority of interactive digital artworks use a mouse and keyboard for input, and a computer screen (or maybe projection) for output. This may be fine for displaying the artwork on the Internet, however in a gallery situation there is the possibility of stronger interaction. It is this stronger interaction between the real and virtual that is the basis of our work. One of the ideas that we are trying to convey in the work is the difference between software and hardware. Namely how software is more flexible and numerous, and how hardware is generally slower and more prone to error. 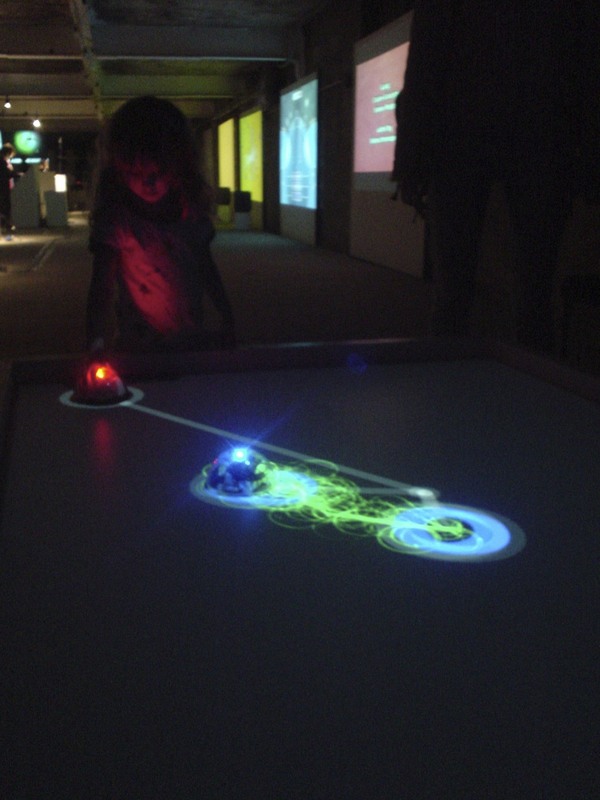 BlipTronic3000 is an installation based around alow level table, upon which sit half-sphere ‘pucks’which can be moved by hand and small autonomous robots which move on their own. Both the pucks and the robots have bright red or blue lights on them, which attract the projected green software agents towards them. Each time one of thesegreen agentshits it’s attractor asound is generated. A seperate low level tone is also being constantly played and it’scharacteristicsare modified by the behaviour of the greenagants. A projector and web-camare suspended from the ceiling above the table. The webcam tracksthe position of any blue or red lights on the table. The positions are then used asattractors for a swarm of software agents. The swarm is then projected on to the surface of the table. Sound is then generated in realtime as the software agents pass through theattractors. This soundis played through a bass ampunderneath the table.